my own pace and convenience. 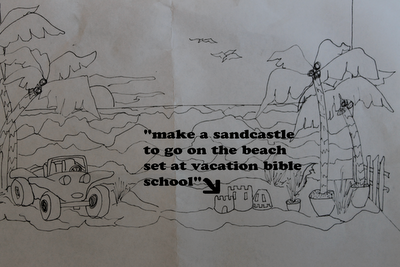 be used on the skit stage for the beach-themed VBS. to achieve the look of sand castles. I saw these coolers being thrown away and liked the roundness of their corners more than the cardboard boxes that I had intended on using for the base of my sandcastles. The tops of the coolers had features that I thought could make good architectural elements without much trouble. Last year I discovered this great foam cuttting tool at Michaels when I was assigned to make and paint foam cutouts for VBS. This tool is about $19 but it is well worth it and very reasonable when you use a discount coupon. It is SO MUCH BETTER than the ones that are battery powered and have a metal "U" shaped holder for the hot wire. Caution: this tool should not be used by children. I used my handy-dandy foam cutter (well, actually, foam melter) to make molding-like features for the sandcastles. The architectural moldings were too thick with the whole depth of the top, so I trimmed it down. To create some interest on the top of the castles, I glued on (with foam glue in order not to "melt" the foam as regular glue sometimes does) plastic cups, sand buckets, water fountain paper cups, star shaped cut-outs, and even a bird house. The blue painters tape is on there to help keep the elements in place while the glue dries. Getting ready for the messy part... adding texture with paper towels and liquid starch. Each paper towel sheet was dipped in the liquid starch and then applied to the foam and cups and buckets, etc. If the starch makes the paper towels stick to the foam as well as it made newspaper stick to my feet, that will be one sturdy castle. It actually hurt to pull it off! Here is one castle (in the hoarder carport) waiting for the starch to dry. My husband offered to put a coat of Kilz paint on the castle to hide the painter's tape and get the starch/paper towel coating ready for more paint. I was hoping to use up some of the bazillion containers of craft paint I have accumulated to put the first coat on the castles. Have you ever hear the expression "If you can't stand the heat, get out of the kitchen"? Well, here in the summer in Alabama, we go INTO the kitchen to get out of the heat. Hmmm....I don't really like this color of sand for the castle. We have almost like sugar colored sand on our beaches. I tried sponge painting some lighter colors over the tan. I thought I had a good close-up picture of the castle after the texture paint was on it but this really doesn't show that it did help it look more like sand. 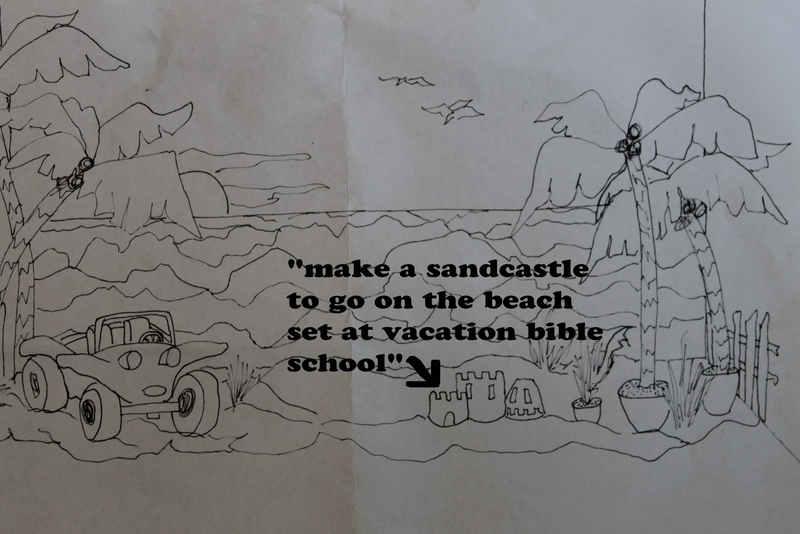 If I had it to do over (and when, really, will I be doing fake sandcastles again?) I would have tried to make the starch/paper towel coat look more stippled than draped. I was going for that letting-really-watery-sand-drip-out-of-your-fingers-look that I like to do on real sandcastles. Was the starch/paper towel technique the best way to achieve this? I don't know, but I had not used those products before in combination and I was willing to try it. Maybe you can use some of the ideas in this post to apply to another type of project. So, in the end, the castles' premiere time was at hand, so they just had to go "as is" and just hope the kids at VBS would get the idea that these things on the stage were supposed to be sandcastles. My husband told me to buy beach toys to sit next to our creations to try to sell that idea. I don't have a picture of the sandcastles "in action" but here they are with other props waiting to take to the stage. These fish were cut out of insulation sheets from the home improvement store and painted for VBS by other ladies at the church﻿. They used a similar tool to the one that I did to cut foam. They are so light weight and easy to cut...much more so than wood. need to make props for VBS, school plays or parties. I think they turned out cute. For some reason it reminds me of a project we used to do at Girl Scout Camp - making sand candles. I was thinking from the title it would be more faux sand, and I guess it is. The castles turned out great. I'd also love to see how to make the colorful foam fish. I am sure you had a great time with your presentation. These look soooo "cool"...thanks for sharing them at my NTT party! It's always great to meet another member of our AUBURN family...WAR EAGLE!!! The castles look great! I love how you showed the different iterations of paint, not just the final finish you went with. I'm sure the kids had a blast with their beach stage. Thanks for sharing. I'm hosting my monthly Before Blogging Throwback Thursdays party, and would love for you to take a pic of something you made/did/bought before blogging and share it at my party. Can't wait to see what you bring. WOW you sure are the clever one. What a craft this is. Thanks for sharing at the newbie party, it turned out AWESOME!